I love Holly Bourne. She is part of the UKYA quadrant that I’m always kind of expecting to see secreted away in an eavesdropping corner of the school that I work at, because her teen characters, the way they act and speak and coexist are so 100% percent accurate that she obviously has some sort of secret pipeline into schools. When you, a sensible, nearly 30 YO official Grown Up Person reading Holly Bourne, it's *creepy* the way the years fall off and you're 17 again and there's boy drama and UCAS and Leeds Festivals and staying on sixth form because college seems too scary and HOW DOES SHE DO IT?? 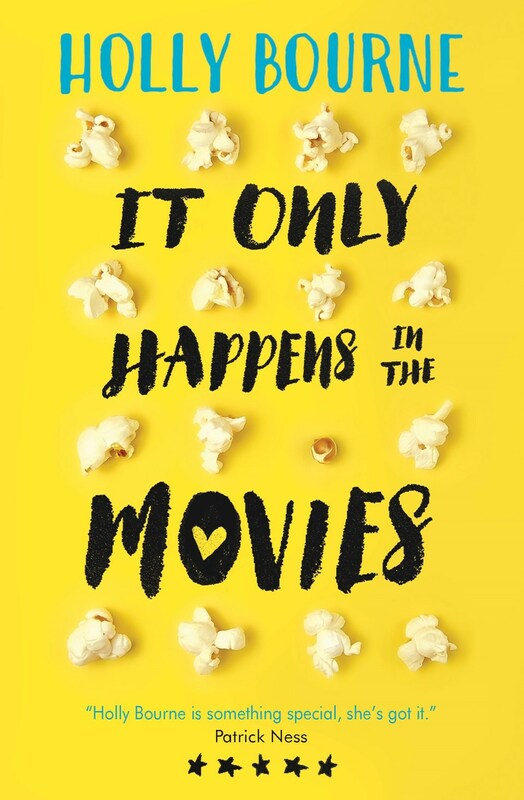 It Only Happens in the Movies is about sixth former, amateur actor, cinema employee and professional cynic Audrey. She is done with love. Recently dumped by her ex-boyfriend after a minor bedroom mishap and major betrayal of trust, she has spent the last year watching her family implode after her dad walked out on her mum for a younger woman and won’t stop rubbing their noses in it, another major betrayal of trust and of love in general. Audrey is so absolutely done that she is going to write an A Level Media Studies essay about how damaging and unrealistic and dangerous romantic comedies are, with their perfect couples and their clichés and their airport dashes and declarations and kisses in the rain. Real life is not like that and the world needs to know. There were a lot of things I loved about this book. I shall nebulously list them. I loved Audrey. Caring for her mum alone, whilst her dad coos with his new, better family, and her brother is off at uni, she is struggling to manage her mum’s depression and irrational behaviour. It shouldn’t be down to Audrey to cope with it, but here we are and she endures in an incredibly realistic way- resentful, bitter, but with love. Because nuance, people. I loved that she tried to keep that line open to her dad, it shows she’s a good person. But it was good for her to confront her anger too. She was resolute and vulnerable, smart and honest and I would absolutely have been friends with her as a teen. I am also a very big not-fan of romance films (10 Things being the exception, I’m not a monster) but I loved how in tune with, and also disgusted and outraged by the tropes and expectations of both cinema and society she was. I loved how all of Audrey’s friends were nice and supportive, and no matter how much she isolated herself from them or felt that she didn’t deserve them so she’s doing them a favour by cutting them off, they were still waiting for her when she figured something out. They didn’t intrude, but let her grieve and be angry and waited. Leroy was lovely and hilarious, and I would absolutely read the Spinster-esque spin off with him as narrator. LouLou was incredible, with her pink hair and her sass and everyone was just a part of a drama-free, supportive friend network and that was brilliant. More please. I liked Harry. I did not love him. He was charming and funny, he was capable of being serious and a talented filmmaker that saw Audrey’s talent. I loved that he made her see her worth, and that it was a value that existed separately from relationships and men and love- it was a talent and a value that was just hers. I liked their relationship. I liked that Audrey knew he was a cliché bad boy, and that it was both futile and formulaic for her to believe that she would be any different than his other many conquests, or for her to even think that she could try and change him. She is also aware of the irony that being aware these things does not mean that she will not attempt them anyway. And then be mad at herself for being predictable and stupid. Audrey is a contradiction, like us all. She knows at the outset that she’s falling into to plot of a rom com, but, aware as she is, she is powerless to stop it. Until she does stop it. I loved the uncommonness of the ending. I don’t want to spoil it, but it is so unusual for a romantic heroine to get to choose. To not have a guy foisted on her. She gets to put herself first, and to make a decision based on what is going to be the best for her long term, averaging out the ups and the downs of a relationship. *spoilery* The “I love you but you are bad for me, so I am going to decline even though it will hurt very much for a long time” is so rare and refreshing and, to prove Audrey’s point, it’s something you rarely see in the movies. 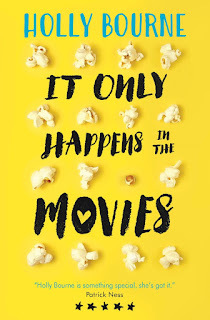 If you love romance films, read it. If you hate romance films, read it more. If you like hilarious, realistic stories with awesome, smart, tough young women in them, then definitely read it.